Me? Oh, hello there. Well, I’ve been shopping at Bailey’s Farmers’ Market for years, even back when it was just a few tents on an open lot. I one-hundred-percent-guarantee that you can’t get better stuff like corn or eggs or tomatoes – well, so many things - anywhere. Last week I decided to try a new kind of bread. Sophie, the lady who makes the bread, is so friendly. Let me tell you something: it practically melted on my tongue. I can’t believe how delicious it was. I think I’d better buy another loaf this week just to make sure it’s really that good. We’ll see. When we were there last Tuesday, my sister, who is mostly a know-it-all-pain-in-my-neck, accused me of flirting with the wildflower man, Abner. So what if I was chatting with him, or trying to at least? He’s nice enough, but he doesn’t say much. He sure knows his way around wildflowers, though. Now, the fella across the aisle from Abner might be something to flirt with – that is, if I was fifty or so years younger. I think his name is Ian, and boy is he a cutie-pie. He’s got this long dark ponytail and matching dark eyes. He even has a tattoo on his hand. He’s everything my mamma would have wanted me to stay away from, and that’s why I find him so interesting, I suppose. I think he’s dating that little blond gal named Becca. When she came by to talk to him, those dark eyes of his lit right on up, along with his million-watt smile. It was kind of fun to spy on their conversation, even if it was from just across the aisle. Becca makes and sells jams and preserves. I bought my first jar of her strawberry jam Tuesday. I haven’t tried it, yet, but I promise you I’ll let her know if she’s doing it right. I’ve done a little canning in my day. My sister and I love shopping at Bailey’s. The food is fresh and the vendors are friendly and helpful. There’s always something new, and every day feels like an adventure. I hope you have a farmers’ market close to where you live. Oh, and I hope it has some cutie-pie vendors, too. I'd love to try some of that wonderful bread you mentioned. I haven't found a Farmer's Market out here in Emberstowne yet, but I'd love to see one start up. Between home-grown produce, farm stands, and farmers' markets, this is the best time of year for food. Come up to Threadville and try Lake Erie Yellow Perch, right off the boats, lightly breaded and deep fried - yum. 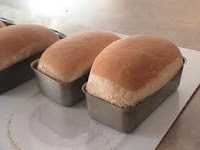 I love a good piece of homemade bread. My grandma Cora used to make the best Parker House rolls, but her health has been poorly since June--I blame my cousin Riley's over-the-top wedding--and she hasn't baked since then. The farmer's market sounds wonderful. Maybe I should see about organizing one in Scumble River. Oh, Skye and Grace - yes, try to organize one if nothing's close by. You'll love shopping there! Haylee, I would be tickled pink to travel up to Threadville one of these days. I've never seen Lake Erie, but I hear it's quite a sight! Phyllis, you don't need to be 50 years younger to flirt, trust me! That bread looks fantastic, I think I have to get some. And with home-made jam--sounds totally delish! You know what, Mary -- you're correct! Thank you. And, yes, the bread is yummy! I just warmed a big thick piece in the oven and covered it with the jam. Delicious! Ooo, bread. Some days I wish I could live on bread alone! Especially if it's warm right out of the oven and slathered with butter...I'm getting hungry just thinking about it. Phyllis, that farmer's market sounds like a little slice of heaven! Thanks for a mouth-watering post! I can taste that bread! Laura -- it is a slice of heaven, right here in South Carolina! I've heard of Woodbridge, Charlotte. It's a great place and it most definitely should have a market! We have the Boulder Farmers' Market, but it's way packed. We have a couple on weekends closeby still trying to make a go of it. It's a lot of veggies and hot sauce, no fresh bread. My 7 year old, Lady K, will be having her tomato stand out in our driveway soon now that our tomatoes have finally come in. We planted late this year, cold spring. FARM FRESH MURDER is on the nightstand....will be up soon as I finish a Louise Penny book. I finished Farm Fresh Murder a few days ago and I LOVED IT!! It was really a great read! My husband is a librarian and had ordered it for the library and he brought it home for me to read. He will be ordering the rest as they are published. Thanks for a great story! You are on my list of favorite authors. I wrestled the computer away from Phyllis. She's a lot stronger than she looks! Vickie -- I would love to buy tomatoes from a stand run by a seven-year-old. Wish I could stop by. Isn't Louise Penny great? Thank you! Patti -- Thank you so much! How cool to be married to a librarian. Please tell him "thank you" too.